I did not plan on writing today. But with the news of Leonard Cohen passing yesterday I’m turning to music and in doing so spending some time with Leonard Cohen’s work. And not only Cohen’s work, but also the work of other artists who were inspired by Cohen. Those who covered his songs, those who worked with him. And I wanted to share a few places where U2 touched Cohen’s world. They crossed in a few places, and I’m sharing them here for those who want to join me in some of my listening today. In 1995, Bono and the boys were working on Passengers, playing with beats, and hanging around with Howie B. Bono was working on the recording of “Hallelujah” when he first met Howie B. This was one of the first songs they worked on together. The song was recorded by Louise McCormick, sister of Ivan and Neil, and Bono is listed as the producer and Howie B listed as “Additional Production and Remix”. “Hallelujah” is one of those beautiful Cohen songs that many of us know. It’s been covered a million times. Bono’s rendition falls a bit short of the mark of some of these other covers, he speak-sings / raps over a beat throbbing in the background. I do admit a fondness for his falsetto singing the chorus. It’s definitely a different take on the song. 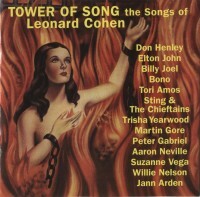 The cover of “Hallelujah” was released in August 1995 on the tribute album, “Tower of Song: The Songs of Leonard Cohen“. The tribute album featured artists such as Tori Amos, Aaron Neville and Martin Gore covering songs that Cohen had written. In 2006 a documentary by Lian Lunson focused on Leonard Cohen. The documentary interviewed Cohen in his own Los Angeles home, and featured performance footage from a number of contemporary artists performing Cohen’s songs at a tribute concert. Although not part of the tribute concert themselves, U2 did agree to perform in the documentary. They agreed to do the song “Tower of Song” under the agreement that Leonard himself would do the vocals. On May 19, 2005, the band joined Cohen at a burlesque club in New York, The Slipper Room, and performed the song a number of times, being filmed by Lunson. The song is mainly sung by Cohen, but Bono comes in for a verse at the end of the song. The song was released as part of the documentary, as well as on the soundtrack for the documentary, Leonard Cohen: I’m Your Man. It was also used as a b-side on the U2 single “Window in the Skies“ released in 2006. This one isn’t a song, but rather Bono reading from Leonard Cohen’s lyrics. The song is “Anthem” a song that Bono would often later snippet in concert. 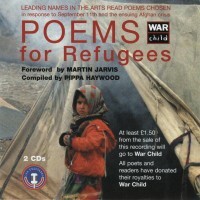 The reading of the lyric appears on a compilation of poems collected and performed for War Child. The audio of artists reading the poems accompanied a book of the poetry. All proceeds from the sale of the book / audio went to War Child. The audio of Bono is much longer than you can hear in the snippet below. He does read the full lyrics to the song. He also introduces the song and speaks about the song during the recording. During that Bono says, “I just wish we could be bigger. Big enough to take the whole world in. Like the voice of Leonard Cohen.” You can read Bono’s whole discussion of the song in the lyrics section. Cohen’s “Hallelujah” often shows up in snippets throughout U2’s tours as well, usually used by Bono at the end of “One” throughout the PopMart tour. Although at the end of the U2360 tour, he took to using it on several nights of that tour as well to introduce “Where the Streets Have No Name”. If you are interested in hearing a Cohen snippet, Bono tends to pull them out most frequently when he is performing in Canada where Cohen was born. Although Bono did slip in a snippet of Cohen’s “So Long, Marianne” during the performance of “Beautiful Day” in Los Angeles on April 5, 2005. Besides the performance of “Tower of Song” for the documentary mentioned above, Bono would sing the song at the funeral of long time supporter and friend Bill Graham at his funeral in Dublin in 1996. The song was performed with members of the Irish traditional band Atlan and The Edge. The Edge himself has covered Cohen, at a very momentous occasion. On April 30, 2016, The Edge was invited to sing at The Sistine Chapel as part as a conference on regenerative medicine and he performed a number of songs. Media was quick to point out he was the first rock star to perform in the chapel. One of the songs that he covered that day was Cohen’s “If It Be Your Will”. One of the attendees at the performance posted footage via their cell phone which we include below. A special thank you for Nicole who suggested I spend some time sharing these with you today. Leonard Cohen was a big part of my life. One of the earliest songs I can remember hearing was his song “Suzanne,” one of my father’s favorites. I’ve been fortunate to be able to see him perform twice and on both occasions was amazed at how a man of his age put younger performers to shame. I highly recommend taking a listen to his own music, and his unique voice for yourself.